Rodents are notorious public health pests. Their filthy habits, the diseases they carry, and the damage they cause make rodent control one of the most important jobs performed by exterminators the world over. In fact, the modern science of pest management traces its roots all the way back to the "Black Death" of the 14th Century, when the association between rats and the plague pandemic was first identified, and armies of "rat catchers" set out to reduce rat populations throughout Europe. 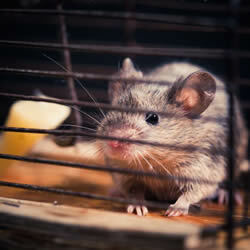 Rodents are still important public health pests. They're known to be involved in the transmission of murine typhus, hantavirus, salmonellosis, leptospirosis, rat-bite fever, Lyme disease, bubonic plague, and probably other diseases, as well. Give us a call for Rat and Mouse Removal services. Rats and mice also contaminate millions of pounds of food and feed with their filth, and cause thousands of fires and communications outages every year when they chew through insulation on wiring. There are many species of rodents, but the three species that Ark-La-Miss rodent exterminators deal with are the Norway rat, the roof rat, and the house mouse. These three species are what we call "commensal rodents," which means that they "eat at the same table" as we do. This is just another way of saying that they live in close association with humans. Give us a call for Rat and Mouse Removal services. Norway rats are brown, heavy-bodied rats with small eyes and ears, blunt noses, shaggy fur, and tails that are slightly shorter than the head and body combined. They have poor vision, but excellent senses of touch, taste, smell, and hearing. They can jump several feet if necessary, have good balance, and are good swimmers. They're also known as brown rats, sewer rats, or wharf rats. Norway rats will eat almost anything. But they're xenophobic and avoid new objects in their environments for several days, including food that mysteriously pops up where it wasn't before. This makes trapping and baiting a challenge.Give us a call for Rat and Mouse Removal services. Norway Rats are burrowing rodents by nature. But especially in cities, where most of the ground is covered by concrete, they have adapted to living in and around human-occupied buildings and other structures. They can often be found in basements, crawl spaces, wall voids, sewers, man holes, utility chase ways, and other protected areas close to their sources of food and water. Norway Rat and Mouse Removal services consists of correcting sanitation problems, removing food and water sources, trapping, exclusion ,sealing rats out of homes and other buildings, and, when necessary, poisoning. Roof rats are also knows as black rats, although their coloration ranges from light brown to jet black. They're more slender and graceful than Norway rats and have smooth, almost silky fur. Roof rats also have pointier noses, larger eyes and ears, and longer tails relative to their bodies than Norway rats. An adult roof rat's tail is slightly longer than its head and body combined. Roof rats are believed to have better vision than Norway rats, along with excellent senses of smell, taste, hearing, touch. and especially balance. They need that sense of balance because roof rats are accomplished aerialists. They live in trees by nature. In populated areas, however, they're quite happy living in attics, basements, crawl spaces, barns, sheds, warehouses, and above drop ceilings, often running along power wires to get in and out of buildings. In commercial buildings, roof rats often use overhead pipes and beams as runways, making the placement of traps and bait stations a challenge. Although they will eat almost anything, roof rats prefer fruits, nuts, grains, and vegetables. Roof Rat and Mouse Removal services consists of correcting sanitation problems where necessary, removing food and water sources, locating and placing traps along their runways, exclusion, and when necessary poisoning. House mice are small, slender rodents whose length rarely exceeds three or four inches. They're usually gray or brown in color, although there are many color variations. They have pointy noses, small eyes, and large ears. Their vision is not very good, but they have excellent senses of balance, smell, taste, touch, and hearing. House mice are omnivorous, but they strongly prefer seeds and grains. Unlike rats, mice do not need to drink water: They get enough from the foods they eat. But they will drink water if it's easily available. Because they're small and kind of cute, most people don't realize that mice can be as serious a health threat as their larger cousins the rats. Because they're smaller, mice are able to get through tiny openings, which often brings them much closer to humans. Mice often live inside wall voids behind cupboards where human food is stored, slipping in and out through tiny openings -- and contaminating our food with filth and germs. Rat and Mouse Removal services consists of correcting sanitation problems, removing food sources, sealing food in rodent-proof containers, exclusion (sealing the mice out), trapping, and when necessary poisoning. Trapper J, a North Louisiana Rat and Mouse Removal specialist is the most professional and Rat & Mouse Removal service available in Monroe, West Monroe, Ruston, Bastrop, Alexandria, and Pineville in the North and Central Louisiana area.